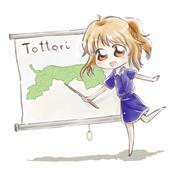 On November 28th 2018, famous late night host Conan O’Brien’s visit to Tottori Prefecture was broadcasted in the United States. Videos of his visit, which include a clip of him dancing the Shan-Shan dance with Governor Hirai, are also available on Conan’s website. 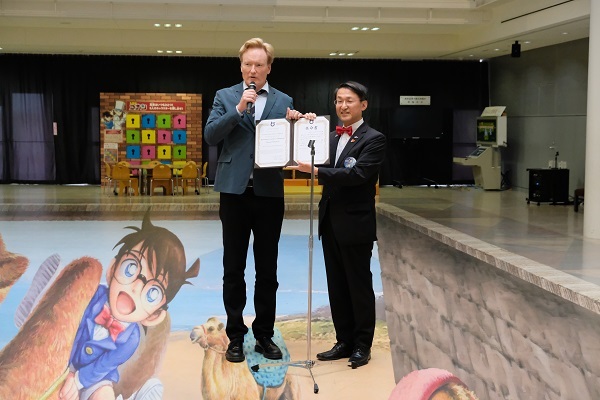 Conan O'Brien met with Mayor Matsumoto of Hokuei, popularly known as Conan Town for being the birthplace of the popular manga and anime character Detective Conan, in Hokuei, Tottori Prefecture on Septemer 6th. Their meeting concluded with both sides reaching a landmark reconciliation known as The Re"Conan"ciliation. The people of Tottori can rest easy tonight for their War of Words with Conan has ended. 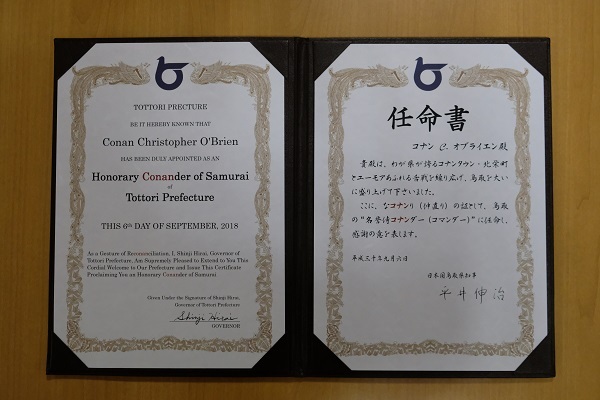 certificate proclaiming Conan an Honorary "Conan"der General of Samurai in Tottori Prefecture. Conan graciously accepted the gift noting that "there's nothing I love more than receiving a weapon just before boarding a plane" while also expressing his appreciation of the appointment by publicly declaring that "of all the appointments and honors I've received in all of the airports of the world, this one is the finest". One of the demands Conan had originally made to Hokuei was for a key to the city - a demand that Hokuei Mayor Matsumoto publicly refused on the basis that Japan doesn't have a custom of giving keys to the city. 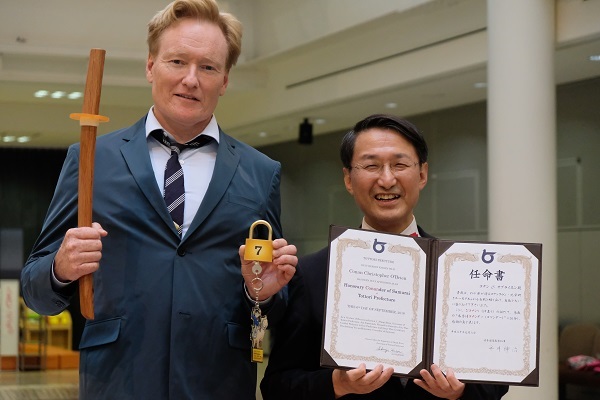 Governor Shinji Hirai apologized for the lack of citywide keys in Japan and, as a form of conciliation, presented Conan with a large lock prominently featuring the number 7 and then a small key. "This key will open the lock," he explained, "and that lock is seven." At this point the relation between key, lock, city, and the two Conans seemed lost not just on Conan but on everyone in attendance; certainly, it would take a detective of Conan's (the Japanese variety) caliber to solve this riddle. "In Japanese, seven is pronounced as 'citi'; therefore, I have given you a key to this 'citi'." 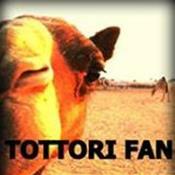 Governor Hirai explained. Thanking Governor Hirai for the kind gift, Conan happily decreed his intent to pay a visit all of the houses in Tottori and take what he pleased. 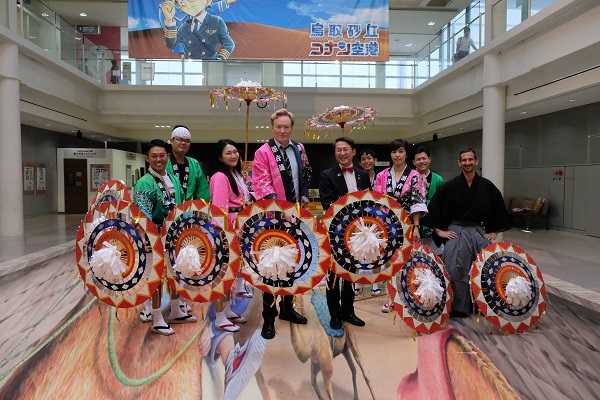 Finally, in a sign of their newfound friendship, Conan joined Governor Hirai in the performance of a traditional Kasa-odori Parasol Dance that held a Guinness World Record in 2014.